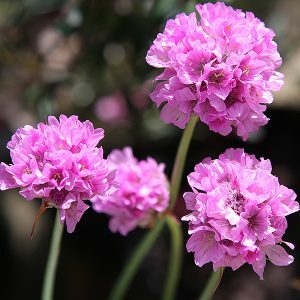 Commonly called thrift, Armeria is one of those unsung heroes of the garden. Its clump forming, evergreen and low growing, which makes it suited for use as a ground cover plant. It also has masses of flowers in spring, all held above the grass like foliage. Well suited to coastal areas and it grows well in containers and in rock garden areas. Its main requirement is good drainage and plenty of sun. 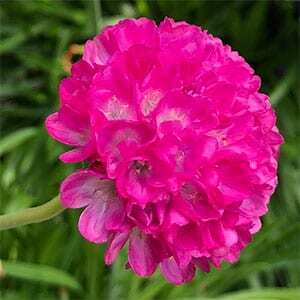 The botanical name is Armeria maritima, and with many colourful cultivars available it is the flower colours that provide variety. From white through to pinks, reds and lilacs you can find an Armeria to fit any colour scheme. One particularly good variety is Armeria pseudarmeria ‘Bees Ruby’, strong growing and long flowering. Best planted in large clumps, its common name has to do with its ability to survive. It requires little fertiliser, is reasonably drought tolerant once established and is not that fussy about soil types. Also referred to as Lady’s Cushion, for the cushion of soft foliage, and ‘Sea Pink’ because it naturally grows in coastal conditions and the species (common thrift) tends toward pink flowers, this is a plant that has a range of landscaping uses. It can be used in containers to underplant taller shrubs. Use it in the garden as a border plant next to a pathway, of as a stand alone plant in a terracotta pot. These are a low care plant once established. Plant in full sun in a well drained soil and water in well with a liquid seaweed fertiliser. Water during long dry summer periods. Deadhead after flowers by snipping back with secateurs to prevent self seeding. Height – Will reach around 10 cm in height, 20 cm with the flowers. Spread – Aver time it will form a clump to around 30 cm. Flowers – White to red, pink and purple. Flowering time – Spring, however will spot flower through summer. Fertiliser – A liquid seaweed fertiliser every month from spring through summer will be adequate. Pruning – Remove the spent flower heads. Ballerina Red – Red flowers. You can grow thrift from seeds, best sown in late winter. They require cool temperatures and moisture to break the dormancy. Cover seeds only lightly with washed sand or vermiculate. Seeds can take some time to germinate so be patient. Established clumps can be divided in early spring.